As all photographers, I also always search for the best camera bag. I already tried few of them and my latest one is the Sling-o-matic from Think Tank. 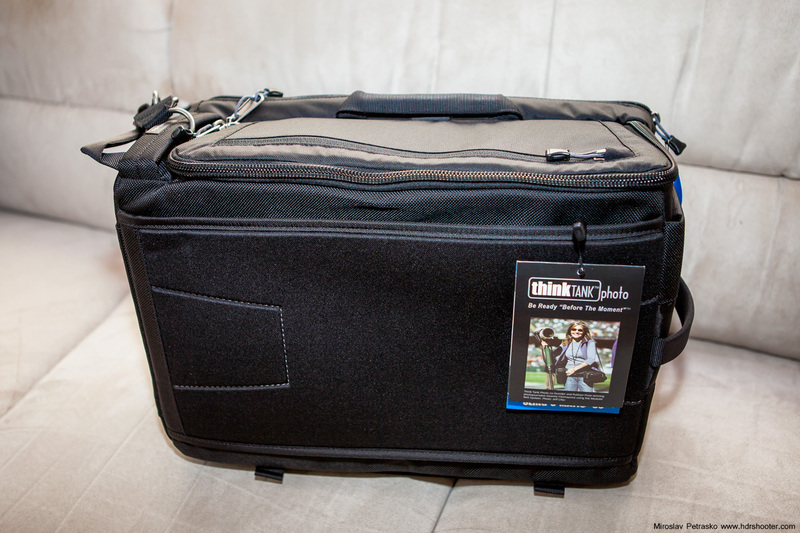 I heard a lot of good about the Think Tank bags, so I thought I give them a try. The Sling-o-matic caught my eye, as I’m not really a big fan of backpack. I know that for long trips, the backpack is the best solution, but that’s not what I needed a bag for. I needed something which I can use for shorter, few hour trips, usually when I’m visiting a city. For instance a sunset shooting. So as I said, it caught my eye, as i wanted something what I just can hang on one shoulder and it still is comfortable to carry. Before I bought this bag I researched it quite a lot online. The reviews were overall very positive, with very few negatives. I think it is a little strange to see people complaining about stuff, which has nothing to do with the bag, or that have been clearly stated in the specifications (like, complaining that a 17 inch notebook does not fit into a bag designed for a 15 inch notebook, or complaining that the bag fits too much and then its too heavy), so I will try to stay with the bag. The bag on its own looks very good. The simple square shape without any overly visible branding or other flashy stuff looks very pleasing. 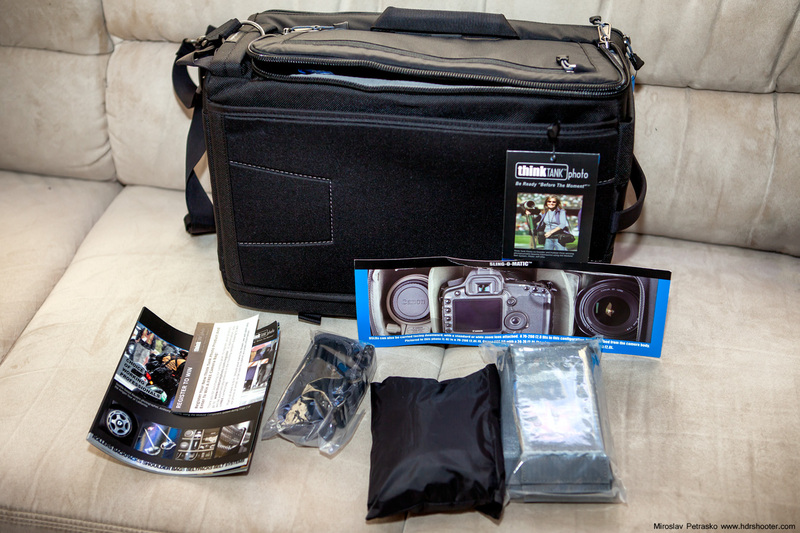 It does not scream that its a camera bag. From outside, the bag looks quite small, but quite big when you have it on your back. That is mostly due to the not really traditional shape. You also get a lot of dividers (more than enough) and chest, waist and tripod straps. The inner space is much bigger than one would expect. If I put my 5D with the 24-70mm F2.8 attached, then add the 70-200mm F2.8 IS II and the 16-35mm F2.8, I still have around half of the bag empty. 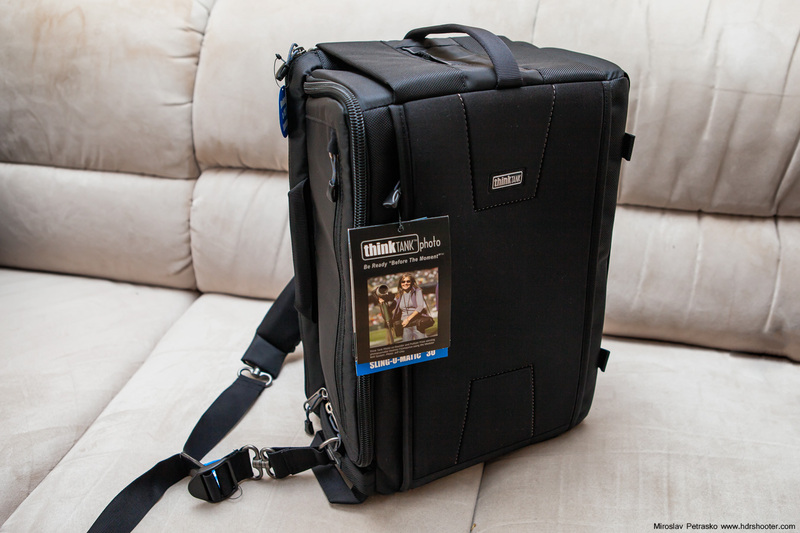 If I compare it for instance to the Lowepro Fastpack 200, which is the same owerall size as the Sling-o-matic, the Fastpack would be already full with such a load. My impressions with the bag in the field are very good. The first try was strange. The bag sits on the back differently than other bags and backpacks I had before. It takes some time to get used to it. But I’ve been using it now for over 6 months and it became very natural. The size of the bag is also perfect for traveling. It adheres to the airline restrictions and it fits nicely under the seat in any airplane. One of the things I was skeptical, was the way they advertise how you pull out your camera. I mean the way you shift the bag in front of you an pull the camera out. But after about a hour of usage, I started doing this without even thinking about it. It was so natural. It works also great when you are changing lenses and need a place to put down your lens. Only issue is when the bag is not evenly weighted down. Then it can distort a little, which make it harder to zip it up again. This feature helped me many times, when I had no place to put the bag down. I have the Sling-O-matic 30, which is the biggest version. It also has a place to store a 15 inch notebook. I tend to store my tablet there, and few times I completely forgot that I had it with me, as you don’t feel it at all. One issue that a lot of other review mentioned, and I noticed also quite quickly, is the absence of usable small pockets. There is one which can be used for memory cards and identification documents, but you cant fit much more into it. If you have stuff like remote, bubble level, filters and similar, there is no real space for this. You can put it into the main compartment, but then isn’t very hard to find them again. As the whole inner area of the bag is covered by a Velcro surface, I will try to correct this by finding a smaller bag, that can be attached onto the inner side (haven’t found one yet). 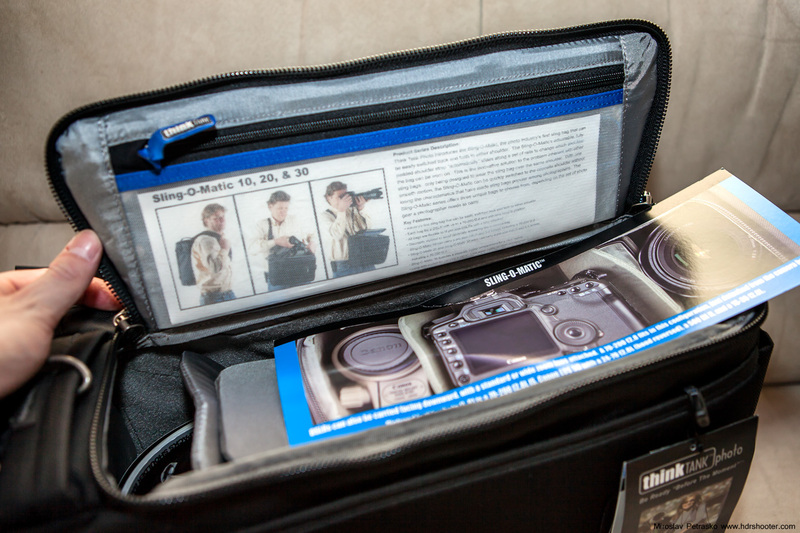 Another thing that is not very natural, is having a tripod attached to the bag. As it is to the side, it pulls the whole bag to that side. I usually don’t attach it and just carry it in my hands. There are also straps to go around your chest or waist, to keep the bag in place. This make longer trips easier, but they are in the way if you want to move the bag in front of you to pull out the camera. Overall I think the bag is great. I been using it for multiple trips and I always get everything into it that I needed. As I stated, it’s not so great for hiking or any longer trips. As it’s not completely balanced, a long trip with it can cause back pain. The feature where you can change the shoulder you carry it on can help here, but only partially. 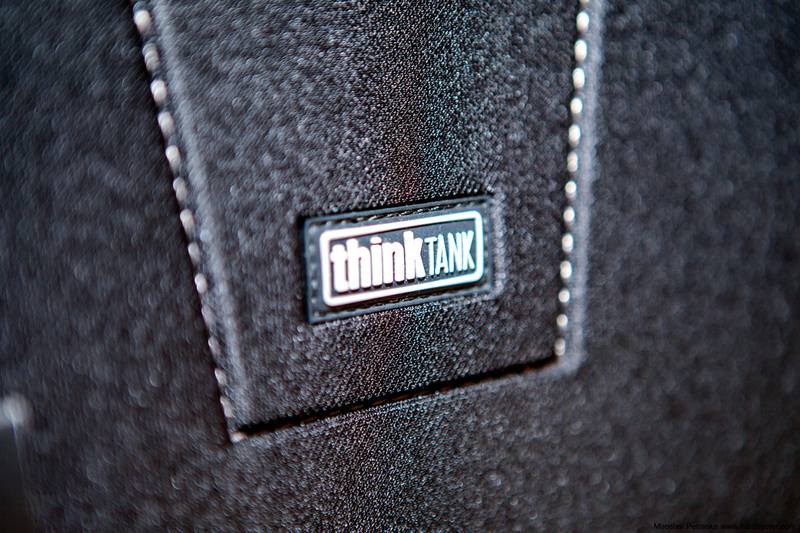 For more information on the bag, please visit the Think tank website.